On December 9, 2018, at around 0130 hours, Santa Rosa Police Officers were dispatched to the area of 200 B Street regarding a possible DUI driver in a tan Chevrolet SUV. While officers were headed to the area, they were given updated information that a witness had seen the driver of the vehicle brandish a firearm at another person. Officers checked the area and were ultimately able to locate the vehicle in the 800 block of McMinn Avenue. 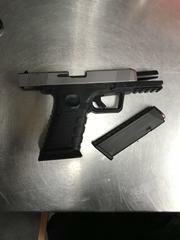 While they were contacting the driver, they saw a handgun in plain view inside of the vehicle. The officers detained the driver and only occupant of the vehicle without incident. The firearm did not have a round in the chamber but had an attached firearm magazine that was loaded. The officers were unable to locate a victim of the brandishing incident.